CHICAGO (Jan. 20, 2017) – A group of Wounded Warrior Project® (WWP) veterans and family members recently experienced the thrill of skydiving – without having to jump from a perfectly good airplane. 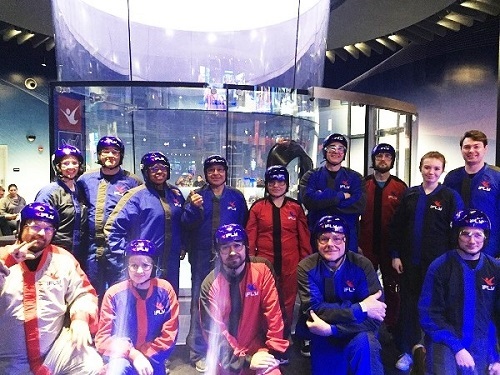 At iFly Indoor Skydiving, warriors tackled an exciting new activity while experiencing the benefits of connecting with fellow service members and their local community. As the evening began, participants enjoyed pizza while instructors entered the wind tunnel, performing stunts for the audience’s entertainment. Then warriors and guests suited up and took their turns to fly. After learning some techniques, participants were soon flying and spinning on their own – and each was brave enough to go for a second run when offered. WWP staff spent part of the evening advising attendees of additional services and personalized therapeutic outlets to assist in their recovery processes. WWP offers a variety of programs and services that help injured veterans with mental health, physical health and wellness, career and benefits counseling, and connecting with other warriors and their communities. Generous donors make it possible for wounded warriors to take part in outreach activities and benefit from program resources at no cost to them.